The Lake District, England's largest national park, has been designated as a World Heritage Site, Unesco said. The national park is now one of just over 1,000 World Heritage Sites worldwide and is the 31st in the UK, joining Stonehenge, the Tower of London and Bath. The Lake District attracts over 18 million visitors a year and there are hopes the area's new found status will further boost tourism. 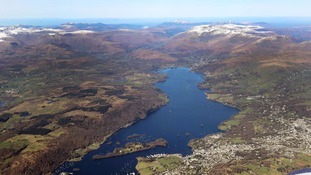 The Chairman of the Lake District National Park Partnership, Lord Clark of Windermere, described the prestigious status as momentous and said it would bring great benefits for locals, visitors, tourism, businesses and farming. "A great many people have come together to make this happen and we believe the decision will have long and lasting benefits for the spectacular Lake District landscape." The Lake District is home to England's tallest mountain, Scafell Pike, which stands at 978 metres (3210 feet). The hamlet of Seathwaite that lies within the national park is the wettest inhabited place in England. The landscape's outstanding beauty famously inspired the 'Lake Poets', including William Wordsworth and Samuel Coleridge. The area was also home to Peter Rabbit author, Beatrix Potter and Pre-Raphaelite art critic John Ruskin. The Lakes also boasts sites of historical importance such as King Arthur's Round Table, that English Heritage believes to be a neolithic earthwork henge thought to be the legendary monarch's jousting arena. The World Heritage Committee was meeting in Krakow, Poland, where it reviewed 33 nominated sites for inscription on Unesco's World Heritage List. The Lakes' bid was formally entered by the Department for Digital, Culture, Media and Sport and Historic England and was the UK's only submission in 2016. Six caves in west Germany with art dating back to the Ice Age and old silver ore mines in southern Poland were among other places awarded the United Nations' cultural agency added to its list of World Heritage sites. John Glen, minister for arts, heritage and tourism, said: "The Lake District is one of the UK's most stunning and ancient landscapes and I am thrilled it has been granted World Heritage Site status. "It is a unique part of the world that combines a vibrant farming community with thousands of archaeological sites and structures that give us an amazing glimpse into our past. "This decision will undoubtedly elevate the position of the Lake District internationally, boosting tourism and benefiting local communities and businesses."